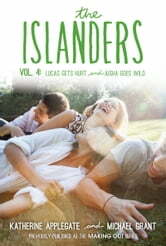 For the Islanders, falling in love is easy . . . staying in love is a lot more difficult. The drama continues in the fourth omnibus edition of New York Times bestselling authors Katherine Applegate and Michael Grant's action-packed series. The first thing Christopher did when he moved to Chatham Island was try to convince Aisha she should give him a chance. And even though she was determined to resist his charms, Aisha soon found herself falling in love . . . until Christopher betrayed her. Now Christopher wants a second chance. But when an old boyfriend comes back into Aisha's life, she is forced to decide whether romance—with anyone—is really worth it. Is Aisha ready to risk her heart again? Formerly known as Making Out #7: Lucas Gets Hurt and Making Out #8: Aisha Goes Wild.